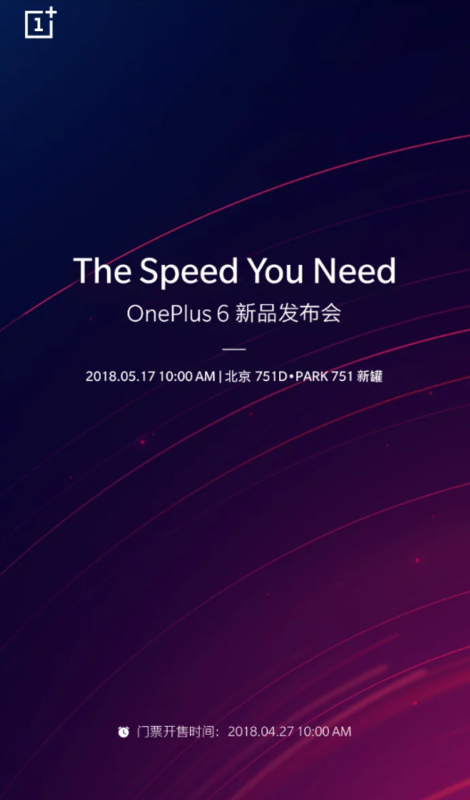 OnePlus 6 Launch Date is May 17 - Playfuldroid! The recently released teasers of OnePlus 6 have hinted that OnePlus may debut it soon. A recent report had claimed that OnePlus 6 may debut in India on May 18. This does not sound wrong because the company has officially confirmed that OnePlus 6 will be launching in China on May 17. The above launch invite states the event will take place in China. The tickets for the launch event will be available for buying starting from April 27. India may get it on May 18 and it may also receive the limited Avengers editions of the OnePlus 6. The Chinese manufacturer is yet to confirm on the pricing of the smartphone. The OnePlus 6 will be arriving with a 6.28-inch AMOLED display with a notch. The handset is expected to offer a very high screen-to-body ratio. The Snapdragon 845 chipset will be powering the smartphone. It may come in RAM choices of 6 GB and 8 GB RAM as well as storage versions like 64 GB, 128 GB and 256 GB. It features a dual camera setup of 16-megapixel + 20-megapixel and it includes 3,450mAh battery that can be charged using Dash Charge V2. Some of these specs are based on the recent rumors of the phone. The exact specs will be known at its launch event.